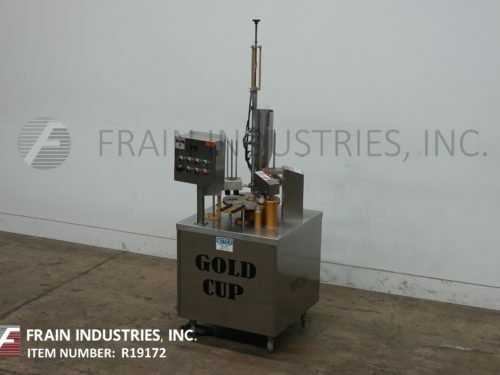 Gold Cup, Model GC6-16, automatic, stainless steel intermittent motion, rotary cup filler and heat sealer. rated from 6 to 25 cups per minute – depending on materials, application, environment and machine configuration. Fill range: 1/2oz to 8oz. Cup size up to: 4" ID x 4-1/2" High, with proper change parts. 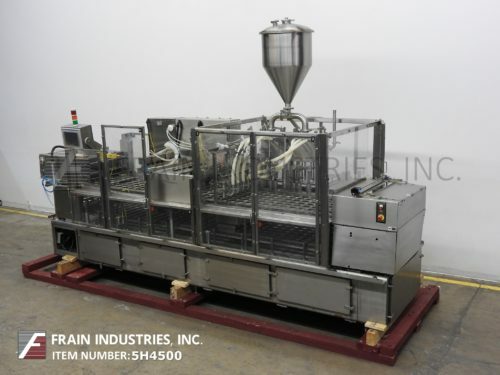 Equipped with 16" OD rotary turn table and has (6) cup pockets, screw cup denester, pre-cut foil lid magazine with pic n place, pneumatic heat sealing head and sweep arm reject station. A/B controller with start, stop, jog, fill, vacuum, and heat, on / off switches and e-stop. Mounted on stainless steel base frame with casters.